I suppose I should be grateful for small mercies, and accept that any ending to this whole sorry affair is a merciful ending. All's well that ends well - or so they say. But the saga still leaves me with a nasty taste in my mouth. It has been very costly for both Ray and myself, not the least of which was the money Ray was charged for fixing the mainspring and drawband on his Noiseless 77, a job which, as an added "bonus", included mangling the platen. Ray imported another Noiseless 77 from the US so his wedding gift could be returned to the state it was in when he received it. I took the platen from this later, 1940 Underwood Noiseless (above, serial #P1229637) and was able to get the second Noiseless 77, the carriage of which had been skipping, fully restored and operational. 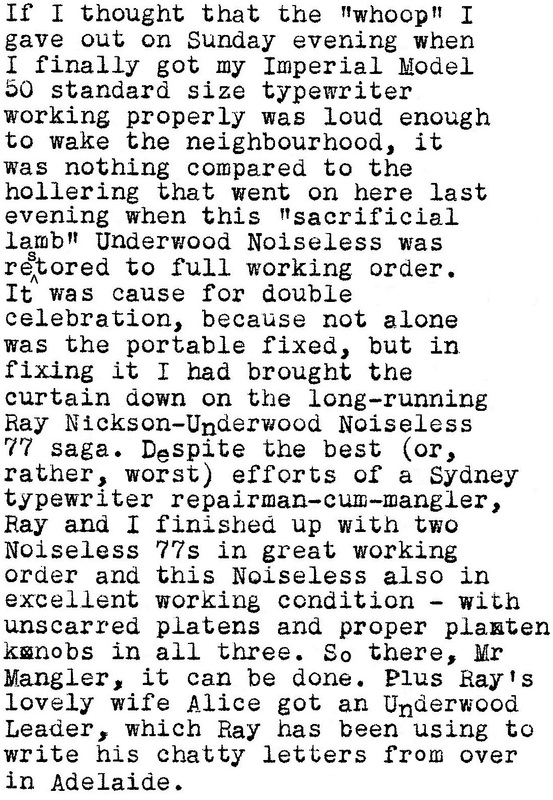 Ray then alerted me to a key-chopper in the US who was selling parts of another butchered Noiseless 77, and with further help from Richard Polt, I was able to get the platen and knobs from that. The platen arrived here yesterday and I was able to get the above Noiseless also fully restored and operational. You could say that in one way Ray and I have achieved a win-win situation, in that we both finished up with very nice working Noiseless 77s and I have this later model Noiseless back with a platen and working properly (though the right-side paper support got busted and one of the ribbon spool covers developed a tiny crack in the process). But to get here we have both had to spend heaps. However, one must balance that expense against what has been a reasonably successful and satisfactory outcome. Personally, I would much, more prefer a typewriter that is in good working order, albeit with a broken paper support and a slightly cracked ribbon spool cover, to one that is not working and has no platen. I promise this will my last word on this subject (unless, of course, the guilty party in all this coughs up the $150 he owes father-to-be, uni-student Ray, in which case I will be "whooping" some more!). You've managed to get me to chuckle about the whole incident now, Robert. I quite literally laughed out loud reading this post. I am so very pleased that we've both come out so well from what was initially a bit of a debacle. And that's in large part to your generous assistance. Not only did my anxious email last year result in a fixed typewriter (eventually), but more importantly I gained a wonderful new friend. Thank you. Although an outsider looking in, I'm glad to see that this is all done now and it has ended as well as could be hoped for. The awful business won't have to be dwelt upon any longer. And what a funny send off, Robert! I'm in the company of Ray, also laughing out loud. When I first read of the misadventures of this little typewriter I immediately thought this is the result of a workshop accident. I Would say the the Buthcher from Marickville has tried to turn down the roller and has not secured the ends properly in the lathe. Once one end came loose all hell breaks out resulting in damage like in your photo. Some how he did not find the intestinal fortitude to 'fess up and then try to compensate his client. Why he felt to remove the platen when he was only asked to fix the main-spring and drawband only he would know. John, you have pretty much summed up what happened. The person in question answered a phone call and left the platen in the lathe. Why it was in the lathe is the $64,000 question in your last sentence. I think I know why, but I'll leave you to guess. A) Ray should not have been charged a red cent; B) An offer should have made to replace the platen with a new one at no additional cost to Ray. Instead of A & B, Ray was given back the typewriter with the ripped, patched-up platen, a left-hand knob which couldn't be re-attached, and asked to pay $150 for repairs! Very nice looking Noiseless. Too bad about the first repair. 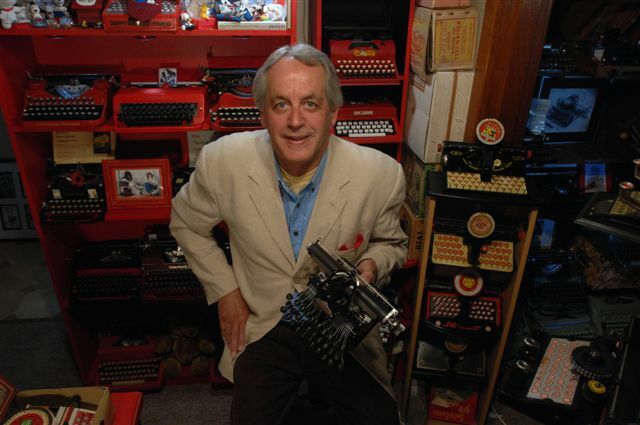 That fellow is a typewriter repairman? I hope my Remington Noiseless restoration is as successful. I hate to be a cynic (though I do it all the time) but is it possible that The Mangler kept Ray's good platen and put in a broken one he had from his own machine? The good platen looks cleaner than the cracked one you got back. Such shenanigans are not unheard of in the repair business. I'm glad for your result; sad that a keychopper got some validation--hope they don't get the idea of making even more money by parting out typewriters before their natural end of life. I love the sheer volume of good work you are doing, Robert. Cheers! Snap! Or should I say, Snapped? My U77 also only has one paper finger. May be it is a sign to keychoppers and demon barbers alike. I thoroughly enjoyed this post -- and glad I found your blog. I have a question that I hope someone here will be able to answer. 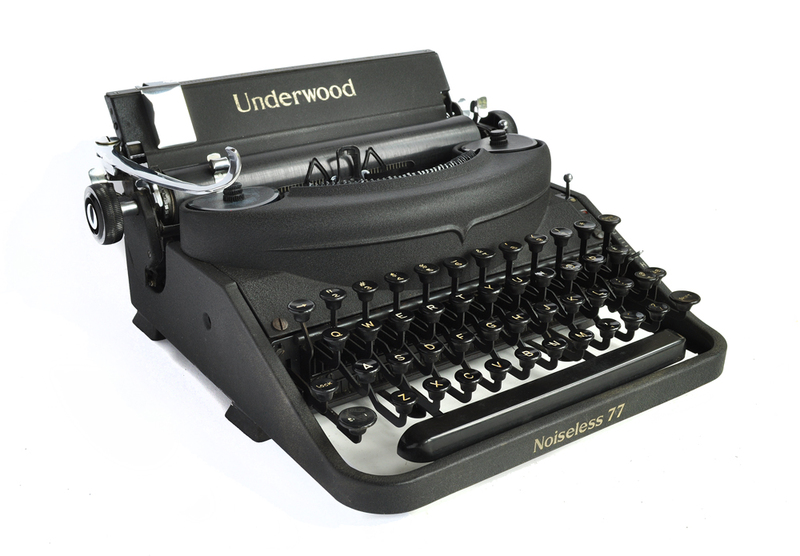 Yesterday, I purchased an Underwood 77 Noiseless Portable that's in great condition. What seems odd (at least to me) is that the typeface is Orator. My searches indicate that this was a typeface developed by IBM in the 80s for their Selectric line...yet mine pre-dates that by 50 yrs. (the s/n indicates manufacture in 1934). I can find no information whatsoever about this unusual font. Does anyone have any information about Underwood's use of this type? Umm, I may be way off track here, but my understanding is that Orator is a sans serif typeface. If you have a 1930s portable typewriter with a sans serif typeface, that would be most unusual, I would have thought? Thanks, Robert. It is indeed sans serif...it's all caps, and the shift key merely invokes a larger point size. I've also emailed Richard Polt about it (and sent photos of the text - which I'm unsure of how to do here); he seemed equally interested. Perhaps it was used for teletype purposes, or for the military. It seems this type was useful in transcribing messages -- but that's just a guess; there are no indications on the chassis of military use.